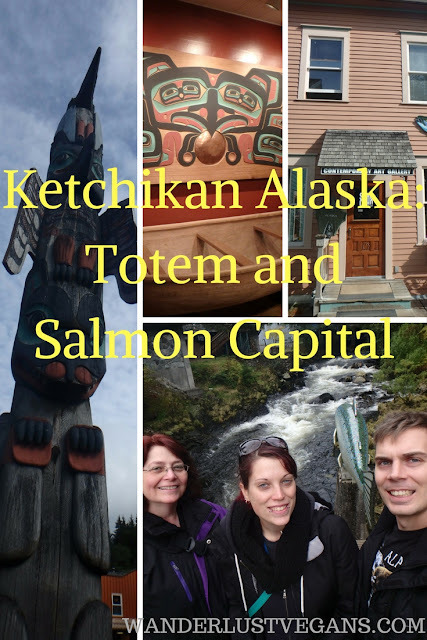 Ketchikan: Totem Heritage Center & The Salmon Capital of the World. Continuing on our Alaskan cruise with Norwegian Cruise Lines, we made it to our final port which was Ketchikan, Alaska. It's a city well known for its totem poles which are found all around the city and as the self proclaimed Salmon Capital of the World. The cruise ship was docked right downtown in Ketchikan which made it easy to just walk off the ship any roam around town. We got our first sighting of a totem pole in a park. We were making our way towards the historic Creek Street. In front of Creek street was the Chief Johnson Totem Pole. It's a remake of the original totem pole but still very cool. Here is mom posing with the totem pole. Creek Street is a cool area with a bunch of shops on the river. We walked all along the creek street area going into shops and looking around. Similar to Skagway, Ketchikan has a history of prostitution going back to the gold rush and you can check out museums like Dolly's House to learn more. We had a map of Ketchikan so we were using it to make our way around town. We wanted to check out the Totem Heritage Center so we started walking there as it didn't seem too far. We made it there after a bit of a walk. We saw that there is a bus you can take there from downtown so keep that in mind when you are visiting Ketchikan. There are a few nice totem poles outside the center. Inside there was a lot of different examples of Native Alaskan art including masks, totem poles, and button blankets. We decided to walk around in a loop back to the downtown area. We walked along the river and saw why Ketchikan is the Salmon Capital of the World. There was a lot of salmon in the river. There was a salmon ladder to help the salmon travel upstream. The current was really strong and you could see the salmon fighting the current. Here we are with a gigantic salmon along the river. Back in the downtown area we went around to the jewelry shops collection our free charms. Some of the shop people seemed pretty fed up with giving away free charms. Don't give away free charms and then expect everyone to buy something. Obviously you are going to get many people just coming in to get the free charms. We took a short walk along the water front to where the other cruise ships were. There wasn't much over there aside from more tourist souvenier shops. We did some looking around and then headed back to the ship. We had a great visit to Ketchikan but it was time to say goodbye. If you enjoyed our time in Ketchikan then you are going to like reading about the rest of our Alaskan cruise journey. We stopped at different ports and we talk about our time on board the ship. It's worth a read for anyone considering going on an Alaskan cruise in the future.